FREE CLASS WEEK – Kids Dance for Free! Hey Parents, mark your calendars! 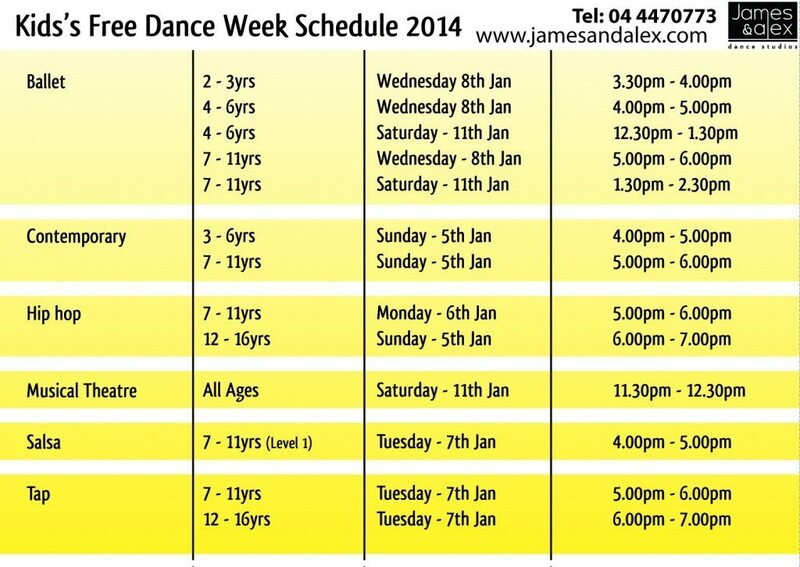 From 5 – 11th January 2014, your kids will get to try a variety of classes for an entire week FREE OF CHARGE. This is open to existing as well as new students so spread the word and tell all your friends! We’ll reply to your e-mail to confirm your registration. http://jamesandalex.com/wp-content/uploads/2014/11/James-Alex-approved-Logo.png 0 0 James & Alex Dance Studios http://jamesandalex.com/wp-content/uploads/2014/11/James-Alex-approved-Logo.png James & Alex Dance Studios2013-12-06 12:42:462016-12-17 15:20:59FREE CLASS WEEK - Kids Dance for Free! Our new kids term re-starts January 2014. Spaces are filling up fast so be sure to enrol early to avoid disappointment. Hayley’s Comet musical theatre terms starts on 5th January 2014. All other classes (ballet, contemporary, hip hop, salsa) start on 12th January 2014.
http://jamesandalex.com/wp-content/uploads/2014/11/James-Alex-approved-Logo.png 0 0 James & Alex Dance Studios http://jamesandalex.com/wp-content/uploads/2014/11/James-Alex-approved-Logo.png James & Alex Dance Studios2013-12-05 12:29:202016-12-17 15:21:05NEW KIDS TERM - Enrol now! Please note that the studio will be closed on 24, 25, 31 December and 1 January for the holidays. Be sure to check out our online schedule for any class changes or cancellations. It’s updated on a daily basis and it’s easy to book yourself in for a class so you’ll never miss out! Make the last month of 2013 memorable by learning to dance and meeting new people! Come check out what our talented musical theatre kids have been up to this term! Hayley’s Comet showcase “A New World” is taking place on Friday 13th December at Ductac Theatre. Tickets for the 430pm show are available at our studio for 50 AED each (with profits going to victims in the Philippines). These little stars will amaze you with their talent so you don’t want to miss it!